Tinder is boldly going where it has never gone before. The so-called “hookup app” is not only taking a stab at shaping more serious relationships, it’s also giving users a break from its most famous feature. Tinder’s latest update is Picks, an exclusive matching option for Tinder Gold members that highlights your most promising matches so you don’t have to sink hours into searching, and swiping, for them. The feature focuses on matching based on education, occupation, hobbies, and other deeper predictors of compatibility. As for your overworked appendages, they’re sure to enjoy the rare opportunity to recuperate from your raging swipe habit. To access your Picks, upgrade to Tinder Gold and tap the diamond at the top of your Discovery screen. 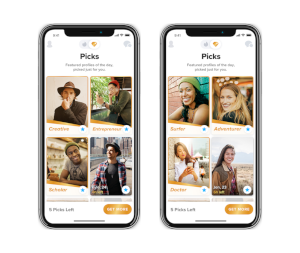 Your recommendations are presented in a grid format featuring large photos and one-word descriptions that explain why each match was chosen for you, like ‘Scholar’, ‘Adventurer’, or ‘Entrepreneur.’ Picks considers a user’s descriptive category as well as your previous swiping behavior to determine who your daily suggestions are. As with any Tinder profile, tap the summary to view more details and images. You can swipe or send them a Super Like - but don’t dawdle, because your Picks screen refreshes with a new set of profiles every 24 hours. Additional Picks are available for purchase in packs of 10, 20, or 30. Picks appears to serve two purposes for Tinder. First, it adds value to one of the app’s premium subscriptions and acts as incentive for free users to convert to paying customers. Tinder Gold launched globally in August 2017 and, according to the company, led to a 60% increase in new subscribers in its first month. Other features available with a subscription include unlimited likes, Rewind, 1 Boost per month, and the ability to change your location to see matches in other geographical locations. 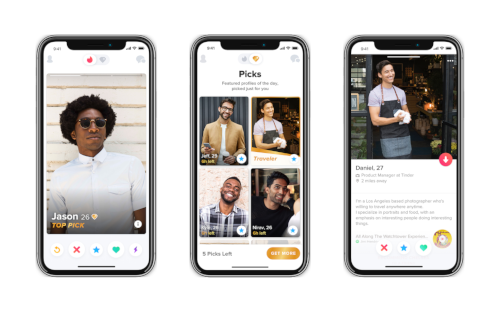 Second, Picks represents Tinder’s first steps into a world dominated by more conventional dating services, in which an algorithm is used to match users based on similar interests, hobbies and careers. Many have noted the similarity between Picks and Coffee Meets Bagel’s matching model. Tinder Picks is currently being tested on iOS in the UK, Germany, Brazil, France, Canada, Turkey, Mexico, Sweden, Russia and the Netherlands. To find out more about this service you can read our Tinder App review.